Angry Bear » Medicare Claim Costs Growth Under 1% in 2013??? Why? Medicare Claim Costs Growth Under 1% in 2013??? Why? “hard times or recession, accounted for only about 1/3 (37 percent) of slower growth in the nation’s health care bill. My guess is that most of the effect was felt in the private sector. and the chief Actuary for Medicare? If Spitalnic’s and the S&P Healthcare Indice projections prove true over the next few years; Medicare will not be growing faster than GDP and healthcare costs would not be adding to the deficit or crowding out spending on education, infrastructure or the environment as predicted. 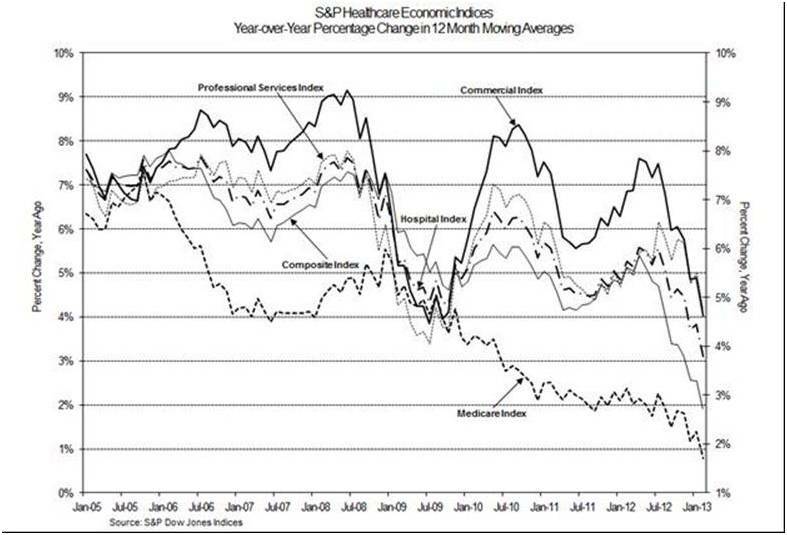 There is no evidence the trend will not continue and Medicare cost growth is at the lowest level since its beginnings. Or perhaps it is what many have said with the advent of the PPACA, a change has and is being brought about in how we are being treated. The overall cost model is moving from a services for fees treatment scenario to a better outcomes and efficiencies for fees scenario. This is precisely what was provided to me by the Great Lakes Home care nurses. Each morning I would weigh in and take my blood pressure three weeks after my open-heart surgery. The nurse would come once per week to my home to which I was confined and check on me. These type of visits by nurses also gave me an early exit from the hospital initially even though the visits were 2-3 times per week and at a far lower cost than keeping me confined to the hospital (I was bouncing off the walls and wanted out). Now, if only Medicaid would start paying for long term home care instead of nursing homes we would be on to something. I consider myself one of the lucky ones. Over a decade ago, we bought long term assisted and nursing home care for a low cost cost, far cheaper than what it costs today. It only lasts for 4 years; but, most only live a few years (to my knowledge) once they enter the system. In any case that coupled to Social Security should give us a decent place from which to pass-on. We are probably more fortunate than the vast majority of people who will depend upon Medicaid or it all. I agree long term homecare is the better way to go and cheaper all the way around even if they incorporate a weekly visit from a nurse. My daughter is becoming a nursing practitioner and she wants us to come live with her and her husband in the attached apartment to the house. It still may work . . .
Because Medicaid can reimburse however much they choose to. The 500 lb gorilla gets his way. I think that’s the point. up to now it has been “pay or die” from the medical profession and the insurance biz. having an 800 lb gorilla on your side is what it takes to get some respect. well, that’s good news for your side. but i feel i need to tell you my contempt for obama is not based on obamacare… though i don’t like being forced to buy insurance from the crooks who have been robbing me all these years. my contempt for obama is based on his stupidity/dishonesty re Social Security. not so fond of drones and gitmo, not to mention his high finance friends, either. Why is just good for my side and not all of us. The reason most people do not have healthcare insurance or can not afford it is because they have been priced out of the market place. Maybe now they can catch up to it? I am not a numbers guy, but it seems like the growth in medical spending would be at least a third higher if it were not for the recession and employers shifting more of the expense to employees. I at least have never suggested that the BFD had no beneficial effects, just that it was very weak tea given the political capital expended and the likelihood that it actually puts off more fundamental reform of our health care delivery system. If it actually bends the curve on medical expenses rather than just leading to consumers paying more and self rationing, that is a good thing, but I question just how much of a good thing there really is. There is more to this than what I posted if you care to read it. Talking to providers and reviewing data from provider associations it appears there are a number of factors contributing. What is not clear is whether one or more of these factors will continue long enough to be declared a trend. The 800 lb. gorilla factor is, indeed, what will be the deciding force on containing health care costs. Insurers have to some extent been able to impersonate a gorilla even to the point of sometimes being accused of employing death panels (anyone who decides what will of will not be paid for). That force has been wielded effectively by insurers and self insured corporations in the legal liability field for many years and I can tell you from personal professional experience that it is very effective indeed. If we ever get to the point of single payer in this country, the problem will become history if the politicians allow the system to use its leverage. They may not. Witness the refusal to allow it for drugs under Medicare Part D.
You got into Angry Bear again! I am sure you will find Word Press easier than blogger in time. The key to much of this is the profit motive. Insurance companies and the healthcare industry have been driven by it with the services for fees cost model regardless of outcome. Now they are being held accountable for outcome and efficiency of service. This is a whole new environment for them. As I said on the phone, the PPACA is only the beginning of something which wll evolve over time. good for your side because it makes your case better. it may even be good for the rest of us. at this point i don’t know. but i can’t help feeling you had to be looking for a fight to think i was implying that it was not good for the rest of us. i would be less likely to think that if i hadn’t felt that way before about your response to some of my idle comments. it makes a difference whether the government is on the side of the people or on the side of the corporations. and i think it is a huge joke that “liberals” can’t understand that.